Parts of the city came almost to a standstill as people stood in the streets, looking up at the mysterious “floating city” in the sky, which appeared to have many skyscrapers. The apparition lasted only a few minutes before it disappeared, UFO Sightings Hotspot reports. 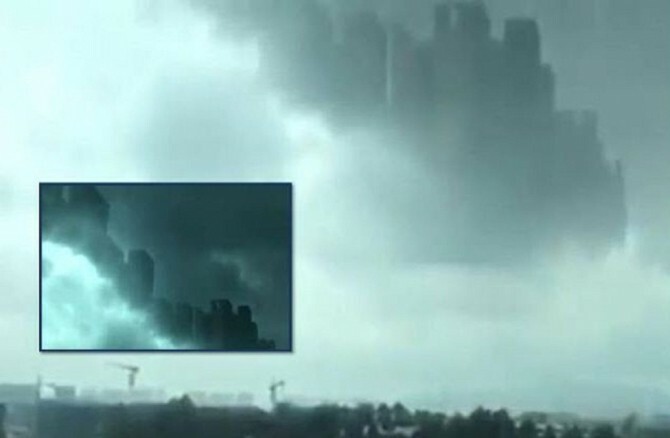 Mysterious Universe reports that a few days after the Foshan incident, people in parts of the province of Jiangxi, China, also reported sighting a ghostly alien city in the sky. This is not the first time that a giant city has been spotted hovering in the sky over a Chinese city. A colossal structure resembling a city with skyscrapers was seen hovering in the sky over Huangshan City in the southern Anhui province in 2011. The Huangshan City sighting was remarkable because several stunned residents snapped pictures of the floating city showing what were clearly tall buildings or skyscrapers with trees. The Inquisitr also reported in April an incident in March, 2011, in which hundreds of residents of the village of Dulali in Lanzai South Ward of Darazo Local Government area in Bauchi State, northern Nigeria, reported seeing a great floating city in the skies above their rural communities. Conspiracy theorists believe that the recent spate of sightings could not be coincidence, and floating cities could be apparitions resulting from tests of the latest Project Blue Beam technology to see how residents of cities would react. Project Blue Beam is a popular conspiracy theory that claims that NASA will soon attempt to inaugurate the Illuminati-sponsored Satanic New World Order (NWO) agenda under the authority of the Antichrist by using holographic image projection technology to simulate the second coming of Christ, or a space alien invasion of Earth. The theory was originated by Serge Monast, a Quebecois conspiracy theorist, who predicted in the 1980s that NASA would implement the project by 2000, although he had predicted initially that the project would be implemented in 1983 and later shifted the date to 1996. With recent developments in the use of holographic devices to project life-like movie images onto clouds, believers say that the implementation of Project Blue Beam is imminent. A research team, called Project Nimbus, recently demonstrated a holographic device reportedly based on the principle of the zoopraxiscope that was able to project the image of a green horseman galloping across the skies. However, not everyone believes that the ghostly city which appeared in the sky over Foshan was a Project Blue Beam test run. Some believe it was a naturally generated optical illusion. 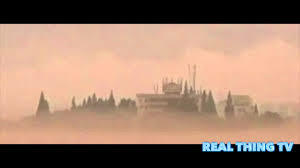 One example is the phenomenon called Fata Morgana. A Fata Morgana is a form of mirage that can be seen on land or at sea. It involves the optical distortion and inversion of distant objects, such as boats, islands, and the coastline. The mirage often appears as a city of skyscrapers because successive images are stacked. Fata Morgana mirages are caused by rays of light undergoing bending when they pass through layers of air with different temperatures.